Chaos, thy name is what is going on in my head. 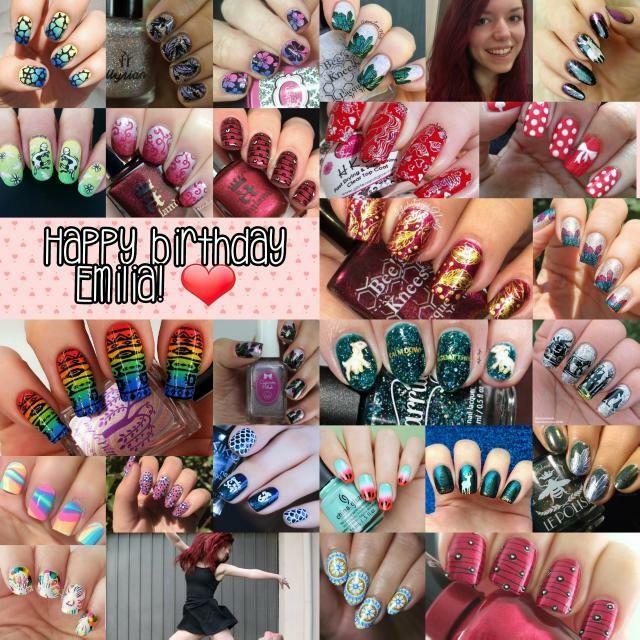 I’m still behind on my Instagram feed, but today is Emilia’s (@nailseeys) birthday and that means the show must immediately post. The theme was a simple recreate so I scrolled through her feed and came across her design for #AZNailArtChallenge’s R is for Roadtrip prompt. I remember not being able to think of a single good idea for it and skipping. 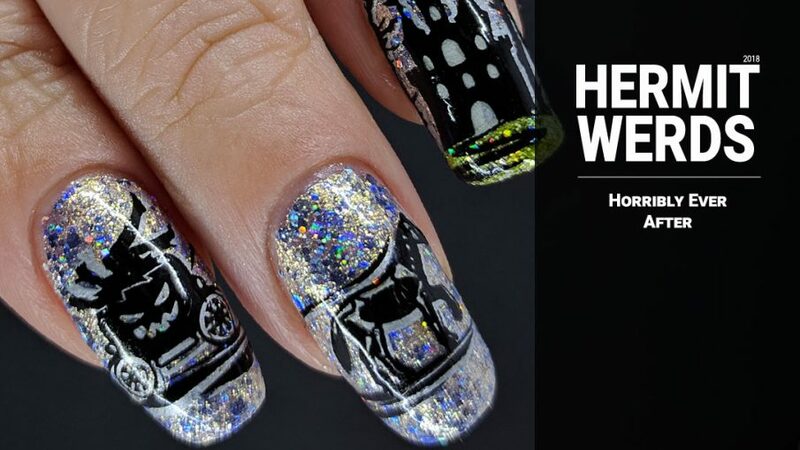 Then everyone posted these brilliant manis that made me wonder why I hadn’t thought of that. Emilia’s was definitely one of them. 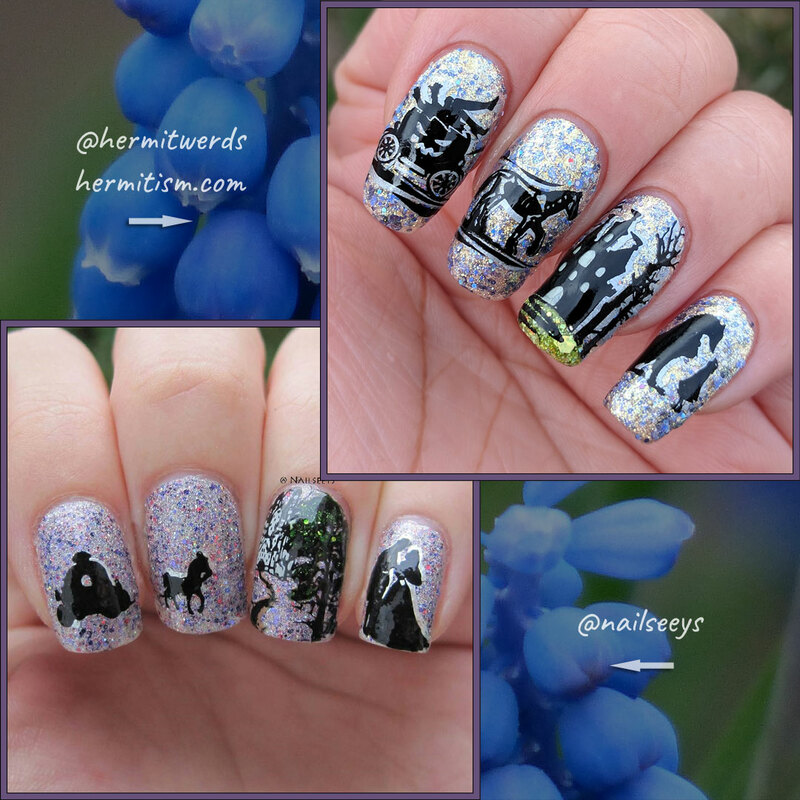 She used one of UberChic’s Fairytale stamping plates to depict a journey and a love story. Perfection! I knew then that this would be the mani that I wanted to recreate and I even had the stamping plate (though obviously not her base polish). But, hold on, just doing what Emilia did didn’t seem the best way to honor her creativity. I’ve been seeing a lot of recreations and twinsie manis on Instagram since I joined in and perfect recreations aren’t the most interesting to look at (though they do speak to the skill of the nail artist). What I find most interesting are the differences. They are beautiful and there’s something to learn from them. So I wanted to recreate Emilia’s mani but do something different as well. 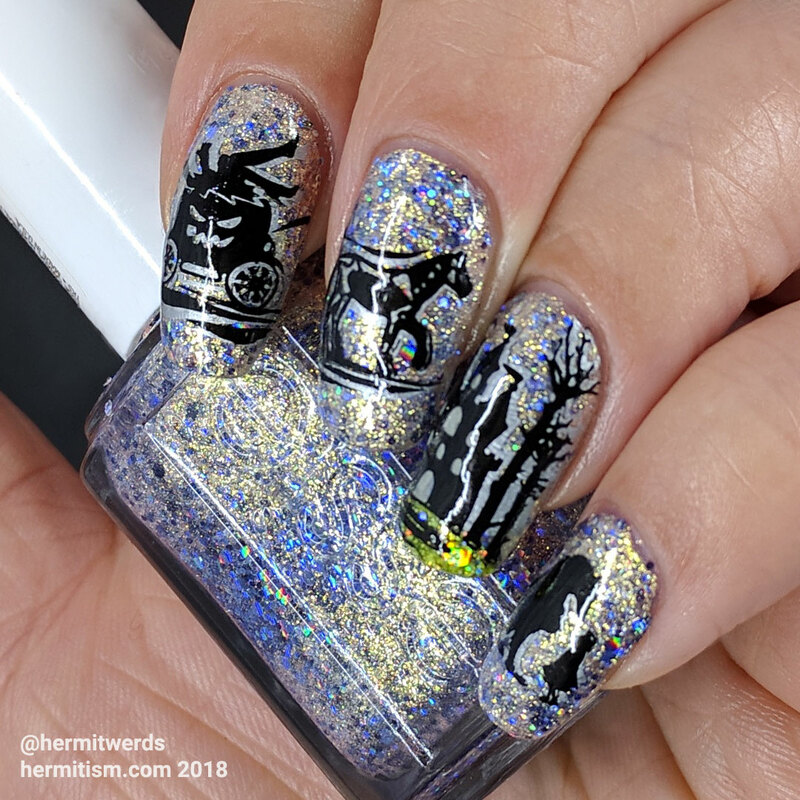 I wanted to preserve her use of double stamp and the noisy sparkly background since both are stepping out of the box for me, so I focused on stamping images. And, lo, who keeps buying Bundle Monster plates when she shouldn’t? I do! Happily Never After plate set, here I come! I tried a lot of different combos trying to match Emilia’s base polish. Then I realized I should just go for something sparkly. Thus, I finally got to use Essie’s “On a Silver Platter” on the blog! It is a gift from my lovely friend Alma and I love it quite a bit, but I usually paint it on my cindy hand for some sparkles and don’t nail art on top of it. In some ways that makes it extra funny since I added even more sparkle on top with a holographic topper. It is, however, not one I’d quickly recommend since the holographic glitter to base ratio is pretty bad. But if you only want to add an eensy bit of holosexual, it is pretty great for its price point. 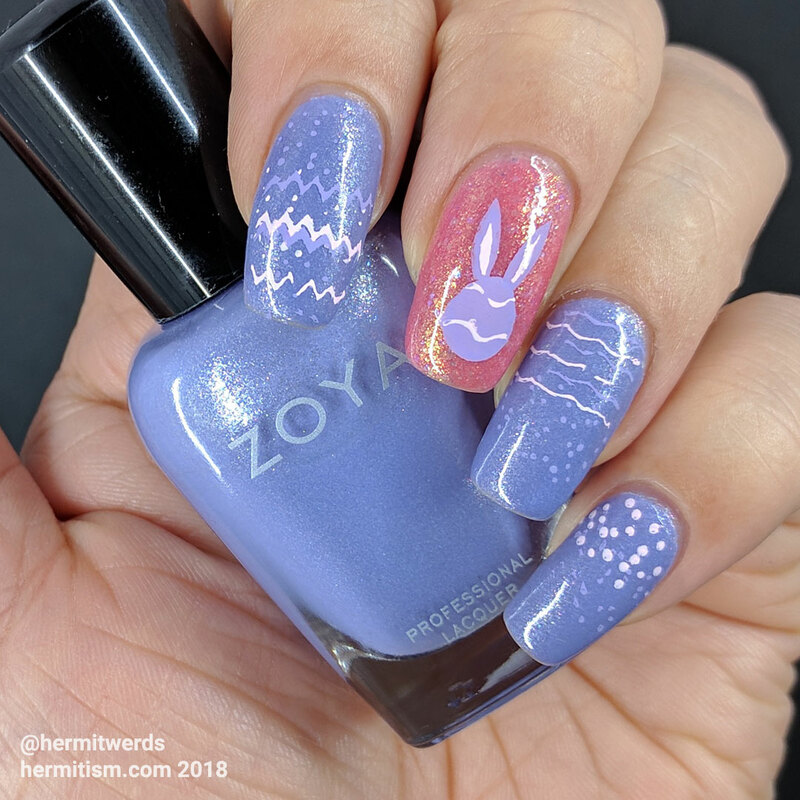 Before we go, I thought I’d share this nail art I did “for Easter”. It was for #WhenColoursCollide’s Pastel prompt and I had a really hard time because I just didn’t waaaant to go that pastel. I probably should have just skipped the prompt, but I already had the base colors on my nails for a day so I just stamped things on it and called it a day. Sadly, I think I did a much better Easter mani last year.